Air101: KLM's new tech allowing passengers to connect face to face-sort of! KLM's new tech allowing passengers to connect face to face-sort of! It all sounds like something out of a sci-fi movie, but what if travellers waiting to board a plane could exchange tips face-to-face with others heading in the opposite direction? KLM Royal Dutch Airlines has built a bar where these travellers can meet to exchange local tips. KLM is launching its “Take-Off Tips’’ campaign in the US, UK, Brazil, Sweden, Norway and Denmark. Using a live connection, customers could chat with a hologram of their counterparts, looking each other straight in the eye. There is no better way to get the best local travel tips. But even more interesting, there is no better way to share real cultural insights. 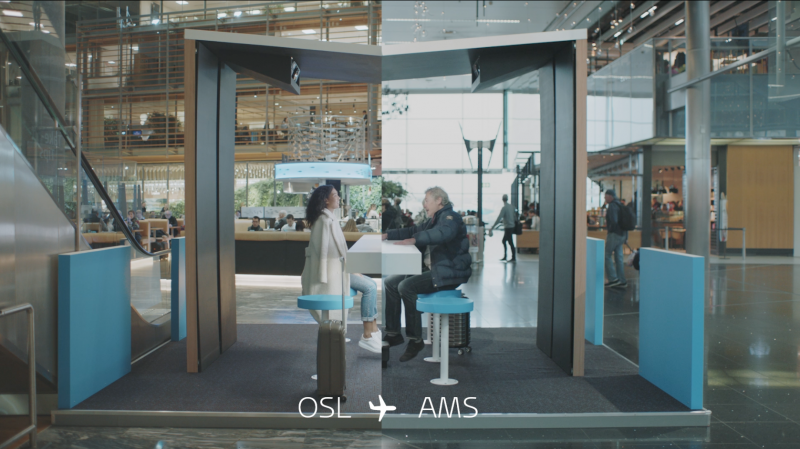 With the help of the Take-Off Tips bar, customers can talk to each other at airports in Amsterdam, Oslo, and Rio de Janeiro – strangers who would otherwise never have met. The hologram bar connected people in real time by projecting them into the airport on the other side of the world. 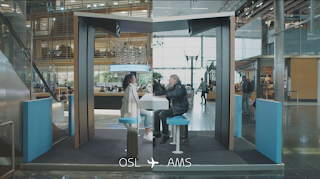 To reach a wider audience with KLM’s Take-Off Tips bar, we filmed the conversations of travellers heading in opposite directions and created a short film of the warmest moments. We have now shared this film online. For ninety-nine years, KLM has been a pioneer in the airline industry and is the oldest airline operating under its original name. This year KLM will celebrate its one-hundredth anniversary. KLM aims to be the most customer-centric, innovative, and efficient airline in Europe, offering reliable service and top-quality products. In 2017, we carried a record 32.7 million passengers, offering our passengers direct flights to 165 destinations with a modern fleet of more than 160 aircraft. We employ a workforce of more than 32,000 people worldwide. "In our industry, it is such a joy to be able to bring people together time and time again, we rejoice this in our latest campaign themes and “take off tips” is no exception. We continuously strive to find means to enable contact between customers including new technologies to create memorable experiences." Said, Natascha van Roode, Head of KLM Marketing Communication.